Bismillahi was-salaatu was-salaamu ala Rasulillah. Alhamdulillah we have made some improvements to the Quran recitation player which should make it easier to learn and revise the Quran inshaa Allah. QuranTracker Ninja Competition: Win a QuranTracker Plus subscription! Bismillahi as-salaatu was-salaamu ‘ala Rasoolillah. Are you a regular QuranTracker user? Has QuranTracker helped you significantly with your hifdh? Have you come up with your own cool way of using QuranTracker to help you manage your hifdh and revision? In conjunction with the launch of QuranTracker Plus we are running a competition to find you Ninjas out there and give you a chance to win a 1 year QuranTracker Plus subscription! 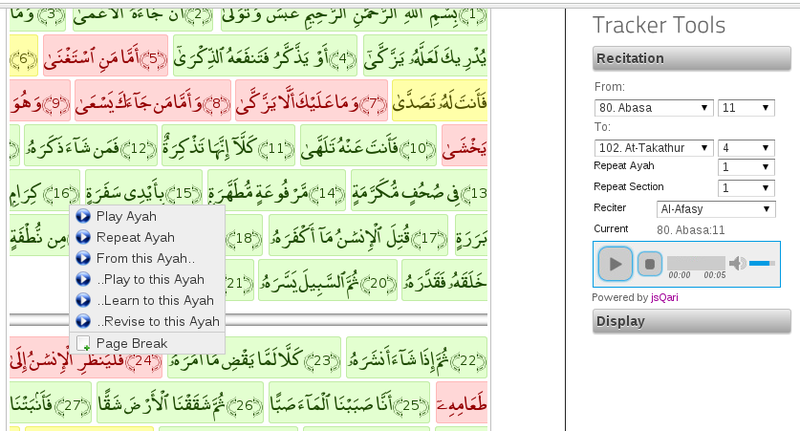 This will also help us to better understand how people use QuranTracker and where we can improve inshaa Allah. Bismillahi was-salaatu was-salaamu ‘ala Rasoolillah. QURANTRACKER PLUS – EXCITING NEW PLANS! We hope that you are all in the best of health and imaan inshaAllah, and hope that you are all progressing well in your Quran journey with QuranTracker.com! We’ve received many wonderful comments and had lots of feedback from our users suggesting and requesting new features and tools to be added to QuranTracker to further benefit ourselves in our memorisation. Many of you have also requested a QuranTracker app for mobile and tablet devices so that you can keep tracking your Quran progress while on the move! MashaaAllah tabarakAllah it’s been great to have all your encouragement and fantastic suggestions! We are also aware that as the number of QuranTracker users has been growing alhamdulillah, our current web hosting package is not always able to meet demands, this often results in slow performance of our website and delays in updating changes. To allow for extra features and apps to be developed and also move to better a web hosting provider, we are launching QuranTracker Plus. Our immediate plans include a mobile/tablet friendly version of QuranTracker, hizb & juz tracking, hifdh tutor tool and a multi-lingual user interface bi’idhnillah! Bismillahi as-salaatu was-salaamu ‘ala Rasoolillah. It was recently pointed out that Surah Ahzab was showing 63 ayahs instead of 73 ayahs. We have now made the necessary changes required to display the 73 ayahs and update any scores for the surah accordingly. If you have Surah Ahzab in your Hifdh or Revision Tracker please check that the 73 ayahs are now being displayed and that your score or percentage is displaying correctly. If there are any problems then please report it to us ASAP. Jazaak Allahu khairan to the user who pointed out this error in the system and we ask anyone who notices any errors like this (or any error) to report it to us ASAP so that we can correct the mistake. We have taken great care to make sure the Quran is presented correctly in the system but we do ask our users to report any errors that have crept in without us realising. Jazaakum Allahu khairan and may Allah accept all our efforts and forgive our sins. Bismillah as-salaatu as-salaamu ‘ala Rasoolillah. It’s been a while since the last update to QuranTracker just before Ramadan but alhamdulillah the new features seem to be useful. We’ve made a few small enhancements to the system.